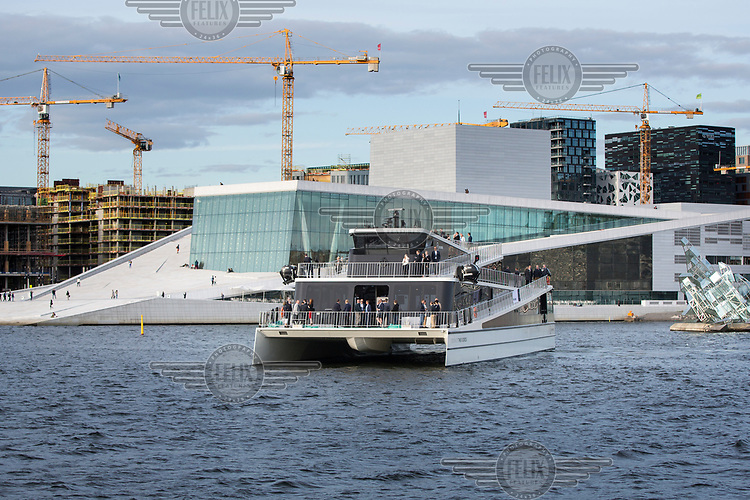 Sightseeing vessel, Vision of The Fjords, in Oslo harbour, next the the Opera. During sightseeing the vessel will be powered by batteries only, while in transit it can use diesel engines to increase the range. The batteries can be charged ether by on-shore power or by the engines on board. The hybrid-electric carbon fiber catamaran is designed and built by Brødrene Aa. The ship is designed to carry 400 passengers and is normally operating in Nærøyfjord on the west coast of Norway.